Join Andy and Terry in their newly expanded treehouse, which now features 13 brand-new storeys, including a dodgem car rink, a skate ramp, a mud-fighting arena, an anti-gravity chamber, an ice-cream parlour with 78 flavours run by an ice-cream serving robot called Edward Scooperhands and the Maze of Doom – a maze so complicated that nobody who has gone in has ever come out again... well, not yet, anyway. The follow on from the extremely popular 13 stores treehouse (which I didn't read!). 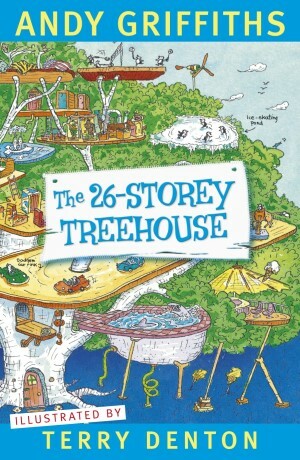 The premise of this book is that Andy Griffiths and his illustrator Terry Denton live in a treehouse, in the last book it was a 13 storey treehouse, but they've extended. 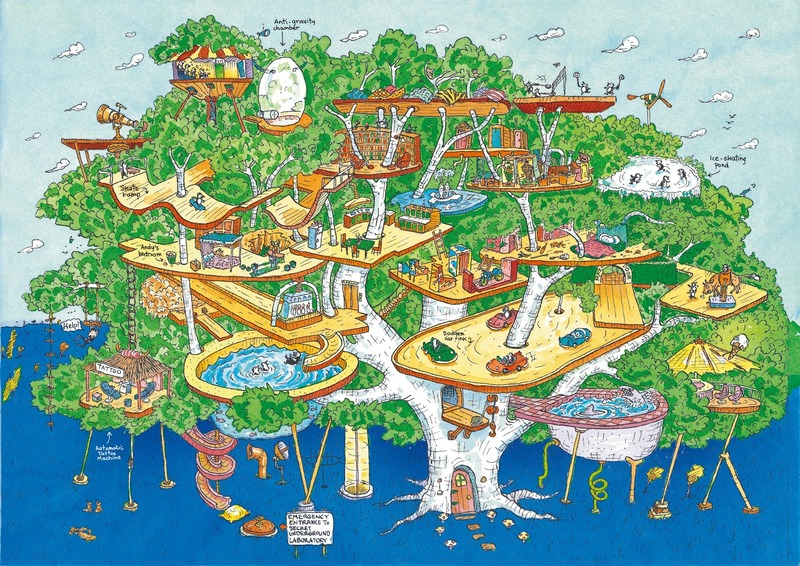 Being a 26 storey treehouse, you can imagine that it's not your average treehouse. This one has a shark tank, ice rink (with ice skating penguins), ice cream parlor with 78 flavours and a robot server called Edward Scooperhands as well as an anti gravity chamber to name a couple of their additions. This is where Andy and Terry live and write, and in the book Andy, Terry and their neighbour Jill talk directly to the reader, telling us stories, but they keep getting interrupted by the 'goings on' in the treehouse. In this book we hear the story about how Andy and Terry met...it involved a pair of inflatable underpants and a pedal boat in the shape of a swan. We also learn how this pair met neighbour Jill, their meeting involved a lot of animals, an iceberg and a pirate called Captain Woodenhead. Captain Woodenhead and his crew died when the pirate ship hit the rugged coastline that Terry and Andy now call home, so it's very surprising indeed when a familiar looking pirate turns up on their shore. This book is jammed packed with Terry Denton's humourous illustrations, and Andy's wacky words, boys will just love it. could you send me that book for free? I am sorry to say that I don't have a copy of the book. I get most of my books from the public library.